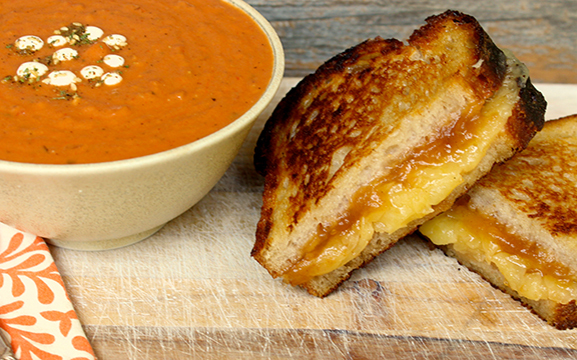 Celebrate #GrilledCheeseSandwichDay with Chef John’s version of Grilled Cheese featuring our Organic Apple Butter and Bellwether Farms Carmody cheese. This decadent version of Grilled Cheese happens to pair perfectly with our 2017 Napa Valley Chardonnay and it is Meg Barkley’s go-to pairing. In a six-quart stock pot, on medium-low heat, sauté shallot in Clif Family Napa Valley Organic Extra Virgin Olive Oil until tender, about two minutes. Add the tomato paste and Clif Family Napa Valley Classic Hazelnut Dukkah and cook for an additional minute. Stir in flour and cook until the raw flour taste has been cooked out, about 30 seconds. Wisk in the chicken stock and cook until thickened. Stir in the diced tomatoes, strained of their liquid and puree the mixture with a hand blender. Return to the heat and bring to a boil. Add in the heavy cream. Adjust the consistency of the soup to your liking with the reserved tomato liquid. Season with kosher salt to taste. On a parchment lined sheet pan lie down 4 slices of bread and butter each side with softened butter. Turn the bread over and spread Clif Family Napa Valley Apple Butter on each side of the bread. Top the apple butter with grated Bellwether Farms Carmody cheese and sandwich the bread together. Heat a pan on medium heat and griddle each side of the bread until golden and cheese has melted.